As you may understand, living in dysfunctional, abusive, addictive, neglectful or chronically ill (both emotionally and physically) families contribute to the loss of one’s soul. We see it become solidified in individuals after years of unsuccessfully trying to control others’ behaviors, feeling worthless, and having very unhappy, unfulfilling and exhausting relationships. Losing one’s soul has a predictable outcome and we see a consistent set of negative thoughts, feeling and behaviors, as well as a disconnection spiritually. Poor Behaviors: Overly compliant, hyper-vigilant, avoidant, controlling, perfectionism, manipulations and other poor coping skills like over eating, drinking, etc. 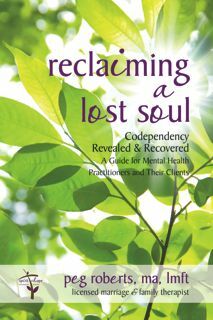 You will find important information and lots of ideas to help with the issue of losing one’s soul. Order the book today by email or phone 952-546-5565.